The Church’s Commission for the Environment has outlined the procedure it says should have been followed to develop tertiary education, leading to a transparent and environmentally sensitive process for setting up a new university. It said a strategy should first have been outlined that took into consideration the impact an expansion of tertiary education would have on the operations and reputation of the University of Malta. “Simplistic comments such as ‘another university will create competition’ betray a lack of understanding of various impacts a new university as proposed would have on the sustainability and quality of national tertiary education,” the commission said in statement. Secondly, a land-use planning process should have kicked in to identify the land needed with “the first obvious direction” being inside development zones “irrespective of whether it is public land or not”. Step three, the commission said, would be an international call for expression of interest with all planning parameters attached to it. “The above process would have provided a transparent and environmentally-sensitive process for the setting up of a new university… embraced by the population,” the commission said. It expressed surprise that the government had issued tenders for small parcels of land or buildings, but in the case of the Żonqor project an investor was chosen and granted 90,000 square metres of land “without any kind of competition”. The commission said it was “baffled” at how Mepa said the site was “most suitable” after only a preliminary assessment. In the past, the government issued development briefs for prime sites within developed zones for which investors, after a competitive process, had proposed, and in fact paid, millions of euros for the land, the commission said. It pointed to “a dismally low appreciation of the Maltese countryside” in certain sectors. “In the not-too-distant past, all areas in Malta were developable according to the whims of the minister responsible for building permits. “Today, everybody is a living witness to the impacts of such a policy. “Let’s keep that dark period in Maltese land-use history as past history which should not be repeated,” the commission said. The 2006 rationalisation process that expanded development boundaries was another sore point. In its appeal, the commission said it was not swayed by the promise of the natural park, which was already there. It criticised the “package deal” presented by the government which tried “to mask the negative impact by piggyback riding on some overarching national need”. In this case, it was the need to regenerate the south, wider opportunities in the academic field and the declared unavoidable need to build on virgin land, the commission added. It said it was “absolutely not against any attempt at improving the education sector” and at providing wider opportunities in the academic field. It has written to De Paul University and the investor to express its concerns. • Strategy for the development of tertiary education. • Land-use planning process to identify land needed that should be within development zones, whether public or not. • An international call for expression of interest with planning parameters attached. • On May 5, the government signs the heads of agreement for the building of the American University of Malta. Discussions have been ongoing for more than a year. • The agreement is with Jordanian investor Hani Saleh. His representative, Thaer Mukbel, says AUM will be set up in collaboration with De Paul University of Chicago. The value of the investment is €115 million. • Government states “a stretch of land near Marsascala” is earmarked for the project, but the exact location is only revealed by The Sunday Times of Malta on May 10. • It is confirmed that 90,000 square metres of countryside is offered to investors. The government promises a natural park close to the proposed university, along the stretch of coast from Żonqor to Smart City covering about 615,000 square metres. • Opposition to the use of land outside development zone is immediate, with Alternattiva Demokratika stressing environmental and social considerations must be at the forefront. • Malta Today reports that part of the land offered to the university investor is designated as a natural park in the local plan. • Three days after the announcement, De Paul University states its involvement is limited to the curriculum and has not committed any financial resources to the project. • This newspaper reveals on May 8 that the pro-ject was only financially feasible if ODZ land was used, since it was being valued as agricultural land to bring the cost down. Any development on the land would raise its value, especially since it is a prime coastal site with unobstructed views. • Times of Malta also reports that 11 per cent of the land is owned by people linked to the era of the controversial former public works Labour minister Lorry Sant: Michael Axisa (il-Lay Lay), Piju Camilleri, Joe Chetcuti, Norman Clews, Joe Formosa, Joe Camilleri, Paul Abela and Manuel Farrugia. • Environmental NGOs raise their voice and the opposition by citizens, academics and professional bodies – including the Chamber of Commerce, Enterprise and Industry and the Malta Employers Association – continues to grow. All welcome the investment but oppose ODZ land. • AUM courses will cost about €4,000 and mostly target wealthy students from the Middle East. • The government commits to restoring Fort San Leonardo on the same stretch of coast as the university but it will be funded by taxpayers. • It emerges that it was the office of Mepa CEO Johann Buttigieg that identified the Żonqor site for the project based on a “preliminary study”. • The Nationalist Party comes out in full force against the project with a press conference at the Marsascala site and questions the planning authority’s impartiality. The party suggests three sites that are immediately shot down by government. • Farmers are concerned they will lose the land on which they depend for a living, saying nobody spoke to them. Government could not say how many will be affected by the project. • On May 16, Labour MP Marlene Farrugia tells Times of Malta she will not vote in favour of a parliamentary resolution on the land for the new university, insisting alternatives are available. 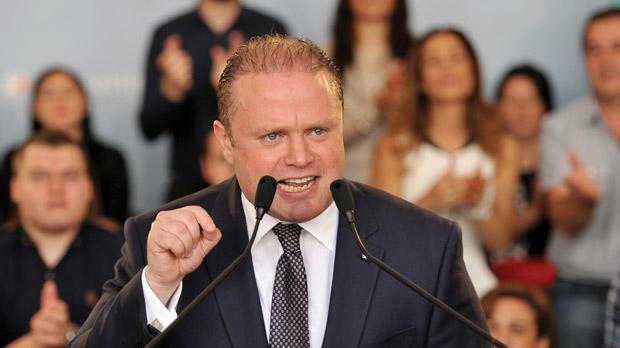 • In an interview with The Sunday Times of Malta, Prime Minister Joseph Muscat says he is willing to consider alternative sites, while admitting the Marsascala land is specified in the agreement as the preferred site. 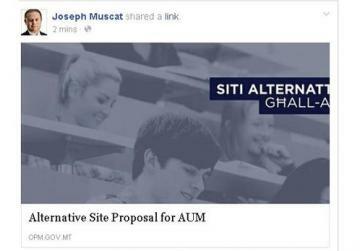 • Dr Muscat admits one of the sites proposed by the PN – the old petroleum division in Birżebbuġa – makes sense. But the investor can’t wait two years for the site to be cleaned up, he adds. • Mepa says full studies will be done once the development application is filed but lawyers tell Times of Malta the planning authority overstepped its authority when recommending the site. They also say Mepa’s decision-making position is now compromised. The Prime Minister yesterday promoted the launch of a new web page calling on the public to propose alternative sites for the university. This has been criticised as a public relations exercise that undermines the seriousness of site selection processes and the need for the necessary studies to determine the best location. One Facebook user replied to the Prime Minister’s post: “It’s not my duty to recommend an alternative site. It is the government’s duty to see that the best possible site is chosen bearing in mind that it is of a minimal impact on the environment and most importantly within development zones”.